Asus announces its G752 gaming laptop, G752 is a powerful machine that is powered by 6th-generation Intel Core i7 (‘Skylake’) processor and up to NVIDIA GeForce GTX 980M discrete graphics. The ROG G752 has 17.3-inch laptop with a Full HD 1080p (1920×1080) resolution with the support of Nvidia’s G-Sync technology. Asus is offering up to 1TB of hard drive space or up to a 512GB NVMe M.2 SSD (256GB and 128GB options also available). 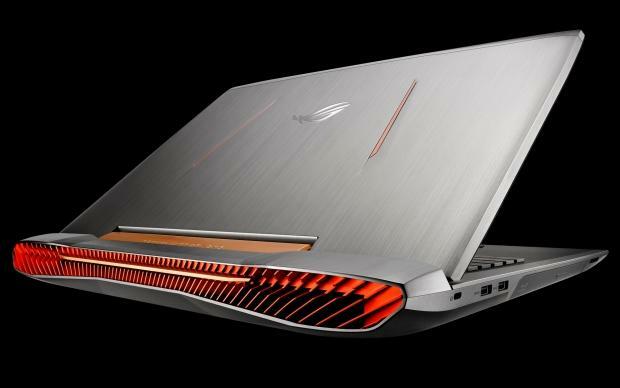 ROG G752 its new Armor Titanium and Plasma Copper color scheme and a hexagonal design with angled edges. For cooling down the machine the ROG G752 uses a “3D Vapor Chamber” alongside a copper heat pipe. The thermal design also directs dust into a dust-release tunnel to keep it away from internal components. The ROG G752 also as an ergonomically-designed keyboard with a key-travel distance of 2.5mm for solid, responsive keystrokes. If you wish to buy this then two of the SKUs are available to pre-order starting at $1,499 direct from Asus, while the others are listed as coming soon.